You may remember that because of the fuss over the view of St Paul’s from Richmond, some buildings at Stratford had to be redesigned to be lower because they stuck up behind the dome of St Paul’s Cathedral. I wrote about it here in June. In July I went up King Henry’s Mound in Richmond and was not impressed. I couldn’t see St Paul’s with the naked eye, and it was hazy with the telescope since it’s 10 miles away! Stratford is another 4.35 miles behind St Paul’s. We need to move on. Who would have believed that a crummy, run down place like Stratford could successfully host the Olympics, and become a desirable place to live? That the legacy would be better than anywhere else in the world? That the V&A, Sadler’s Wells and the BBC would want to setup here? 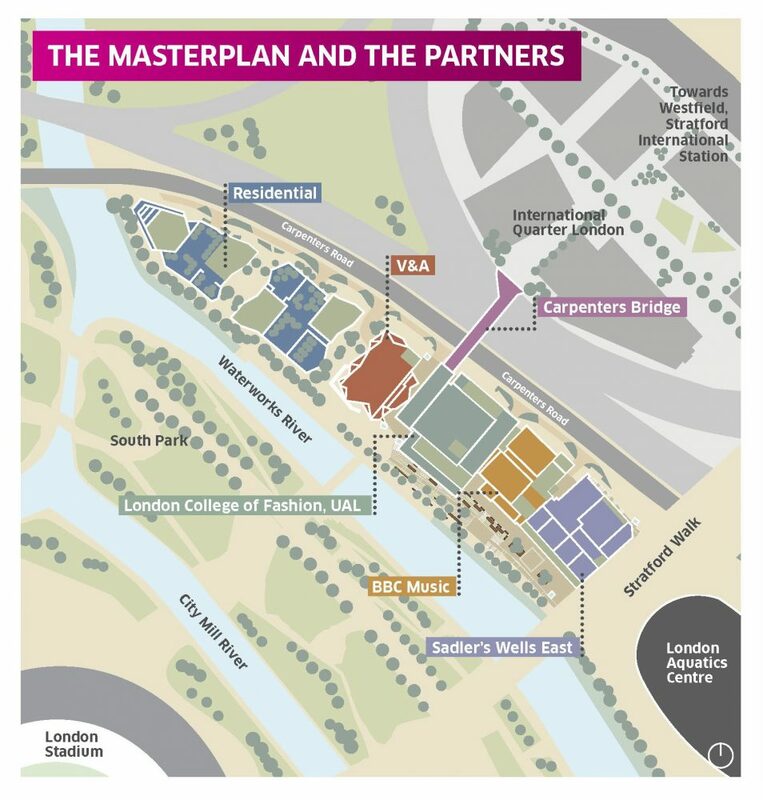 Stratford Waterfront Masterplan: BBC, London College of Fashion, Sadler’s Wells, V&A. The new Stratford Waterfront masterplan is out for you to see on their special website, where lots of information is available. See the masterplan flyer (pdf). BBC Music, London College of Fashion, Sadler’s Wells East, and V&A East will be going where the fairground has been, the other side of the footbridge from the Aquatics Centre.